Are there better social media options? More and more people are telling me that Facebook, Insta and Twitter are ‘a necessary evil’ that they put up with as a way to share their creative work or promote their business – and then, they add that the algorithms used by those pages mean their posts aren’t always seen by their followers, meaning they have to work the system – constantly repost and interact with other pages, to try to make an impact. Of course many people love the social media sites as a way of staying connected to friends (which was the original benefit), and stalking celebrities, (which has probably over-taken that original intention!). Still, many of those same people worry that they spend too much time scrolling through seemingly endless Facebook content, that isn’t even from pages they follow, or about the trend of projecting the perfect Insta life, or the significant anger that seems to surround so many tweets. If only there was a social media option that allowed people to share content with friends and followers in a more positive and controllable way. Of course other platforms do exist but the sheer scale of the Big 3 makes it hard for another to break through. And yet, isn’t it time for something new? Could there even be an option that we would be less worried about letting our kids sign up to? I’ve been using Vero ‘true social’ for most of this year, as a different social media site. I absolutely love it and highly recommend you give it a try. So much so that I’ve quit all other social media sites now. And yet for some reason Vero just felt right to me, and I stuck with it beyond the temporary tech glitches. Now I’m slowly encouraging people to give Vero another try. It’s worth saying that I have no commercial investment or reason to promote Vero other than I just really like it – this is a genuine recommendation. If you haven’t the foggiest what I’m talking about, here’s the low down on what Vero is, and why I like it so much. 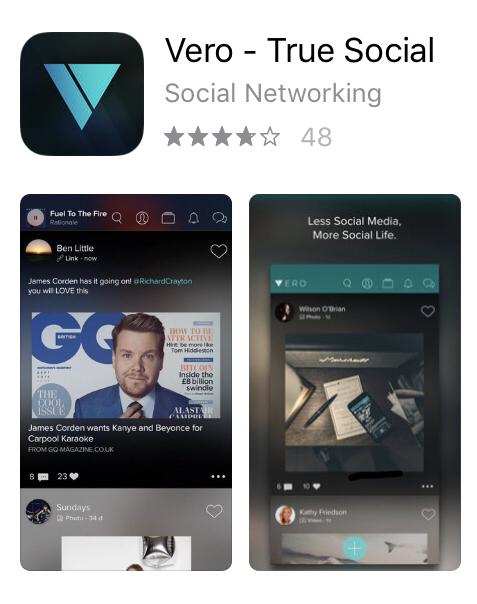 Vero is advertised as True Social – ‘Less social media, more social life‘. It’s quite simply people and businesses sharing content that they think will be interesting to others, inviting comments and discussion. You can post a photo just like Insta, or share a link just like Facebook, or recommend music, a book, a film or TV show, or a place. Each of these different types of post becomes a ‘collection’ and people can see, for example, a collection of books that their friends have recommended, or how many of the people they follow have shared a particular film. If you click on the film or book image someone has shared, you can read a synopsis or watch a trailer. I love that part! It’s constant reviews from people I trust, or people who I have found on there who can bring me new ideas. There are no adverts or ‘suggested posts’ or ‘your friend likes this’. I only see posts from the people I choose to connect with – and they are in date order, not re-shown to me over and over because someone else has commented for the 20th frigging time! On a similar point, there are no algorithms deciding who sees what. So if you run a page and someone follows you they will see everything you post in their feed. Everything! In date order. 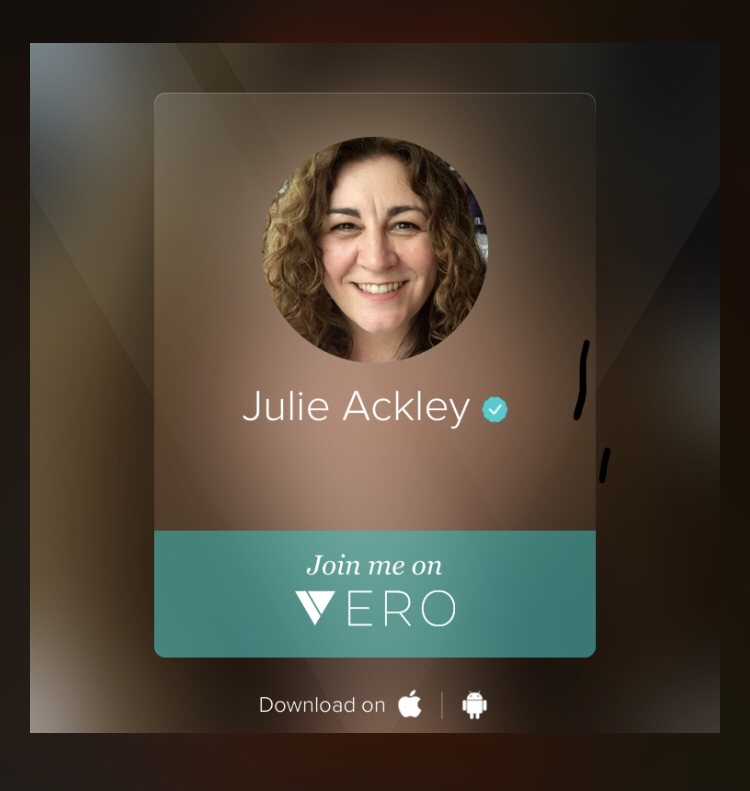 Vero is full of creative types, so if you like photography or art or films there are plenty of people to follow who share great content regularly. You can ‘introduce’ people to others and see who they recommend. Privacy options are much better – you can both Connect with people you know (like friends on Facebook) and / or Follow people (like on Twitter). So when you post you can choose if you want to share each item with everyone who follows you or just a group of friends you are connected to, really easily. There are several celebrities and some big name companies including the Washington Post, British GQ and most popular of all, Zack Snieder – director of many famous films – he has a very loyal fan base! But the majority of people on Vero are just normal, incredibly positive and supportive – unbothered about numbers of followers, and just genuinely interested in sharing content with people who like what they like. The only thing that’s missing is more users. Vero is still in the millions, rather than the Big 3’s billions. When I first joined, I didn’t immediately have an instant feed of people I knew – and that’s where some people get stuck. But if like me, you have a look around and find people who like what you like, you might just really enjoy Vero as much as I do. So if you fancy giving something new a try, #joinmeonVero and say hello. And let me know you read this post, so I can follow you too. Author Unbalanced WomanPosted on November 19, 2018 January 9, 2019 Categories *FEATURED*, OpinionLeave a comment on Are there better social media options?